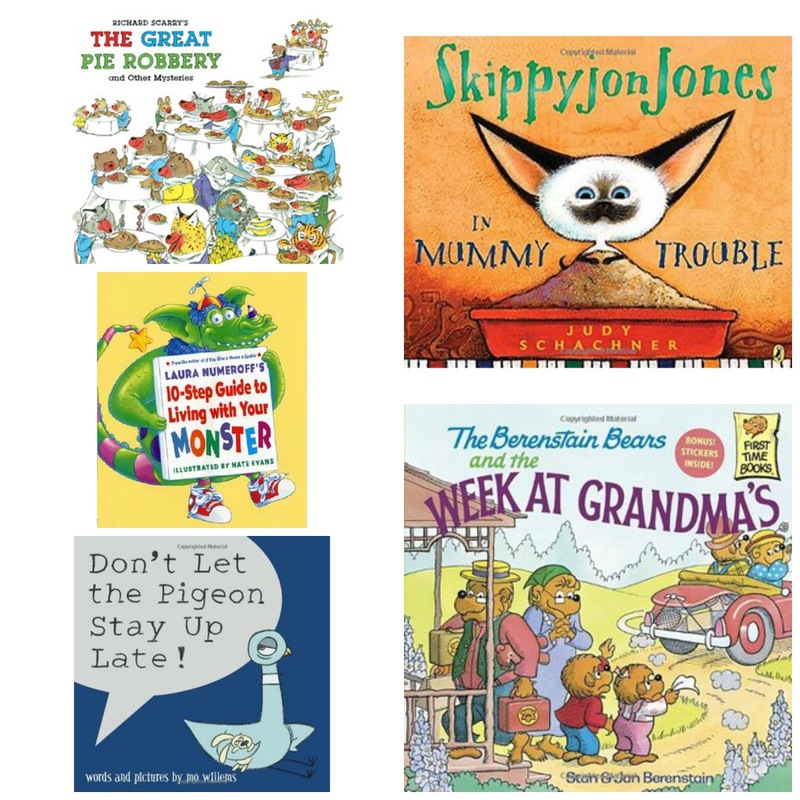 The Great Pie Robbery and Other Mysteries by Richard Scarry - My son loves to play detective, so when we came across this fun collection of mysteries, I knew we had to read it. I'm so glad we did, because it is absolutely fantastic. Not only is it a great read-aloud, it's pretty funny as the two detectives are always getting into hilarious situations. Skippyjon Jones in Mummy Trouble by Judy Schachner - My son has just started this series and to be honest, I really don't enjoy it. I find it really, really weird, but my son thinks it's hilarious. He is always laughing out loud and my husband loves it too. Perhaps it's a boy thing? Who knows, but anyway, it's about a Siamese cat that thinks he is Chihuahua at times and has a group of imaginary friends. When he is on this particular adventure, he finds himself in Ancient Egypt. You have to have a lot of prior knowledge of Ancient Egypt to enjoy this one though. 10 Step Guide to Living with Your Monster by Laura Numeroff - My son is really into monsters right now (thank you Monsters, Inc.), so he thought this was a fun read about taking care of your own monster. Thankfully all the monsters depicted are friendly looking, so it's ok to read before bedtime. The Berenstain Bears and the Week at Grandma's by Stan and Jan Berenstain - The Berenstain Bears are still a hit in this house and this particular book is just an ok addition to our collection. Basically the cubs stay at Grandma's while the parents go on a second honeymoon. Of course the cubs have fun and realize being away from their parents once and awhile is ok. It's not my favorite of the series, but of course it has a good message. Don't Let the Pigeon Stay Up Late by Mo Willems - We absolutely love all the pigeon books and if you have a little one that loves to stay up late and make excuses as to why he/she can't go to sleep, you must check this book out. It's pretty funny, too, which I have come to expect from Mo Willems. The Berenstain Bears No Girls Allowed by Stan and Jan Berenstain - I actually really like this one as it teaches how we should all play together and not exclude anyone. Preschoolers can really appreciate the message. How to Catch a Leprechaun by Adam Wallace - We read this over St. Patrick's Day and it's so much fun, especially if you use it as inspiration for making your own leprechaun trap. Mighty, Mighty Construction Site by Sherri Duskey Rinker - This companion to the ever popular Goodnight, Goodnight Construction Site just came out and it doesn't disappoint. Although I enjoy the first book a bit more, this one is just as fun as it revisits a lot of the same trucks along with some new female (!) trucks as well. My son loves it and it's all about teamwork. Tyrannosaurus Wrecks! by Supida Bardhan-Quallen - Of course I'm sharing another dinosaur book today. This one is especially cute, because it depicts a bunch of dinosaurs at preschool. Unfortunately, the T-Rex keeps making a mess! 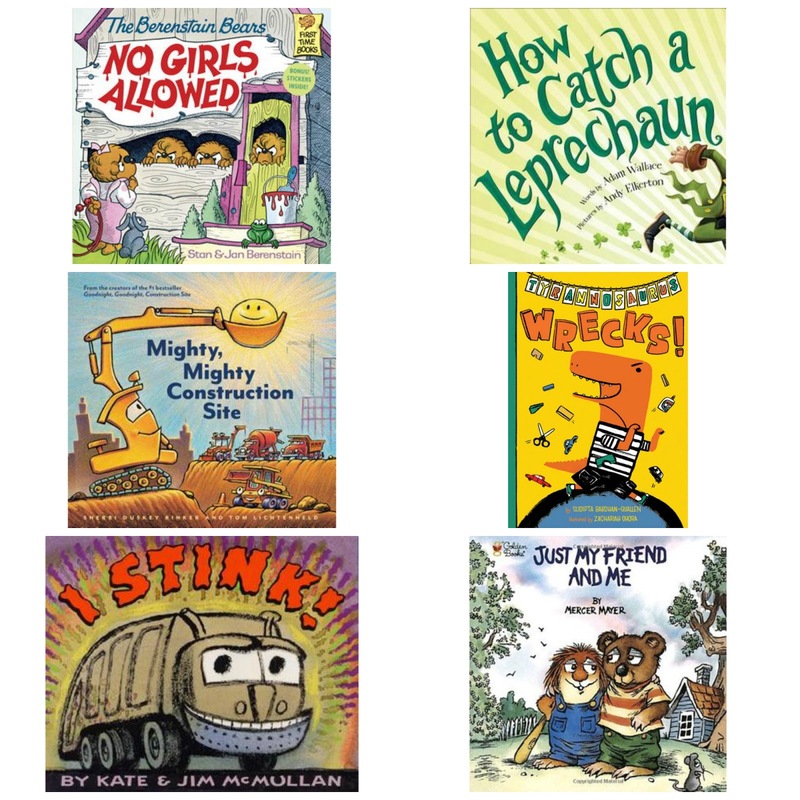 I Stink by Kate McMullan - All the little ones out there that love trash trucks will absolutely adore this book. It's all about what the trash trucks do while we are sleeping. I'd have to say it isn't my favorite trash truck book out there, but my son seems to enjoy it! Just Me and My Friend by Mercer Mayer - The message of this book is really, really good, especially if you have a preschooler that is learning to make friends. Little Critter has a friend over, but things don't go as planned! Happy Easter, Mouse! by Laura Numeroff - It's that time of year where we break out all of our spring and Easter books. This one is a favorite, especially because it involves mouse figuring out who is hiding the Easter eggs. The Going to Bed Book by Sandra Boynton - This is the latest addition to our Boynton collection and although this one isn't my favorite of hers, it is a cute read for bedtime. Baby's First Side and See - Under the Sea by Fiona Watt - These Usborne books are incredible. This is our first Slide and See book and I have to say I am thoroughly impressed. If you have a baby who loves flap books, but is always tearing the flaps, this is the perfect book to remedy that. At first, my little guy just liked looking at the bright colors and seeing the different things on the page move, but now he can slide it himself, which is exiting! He absolutely loves this book! 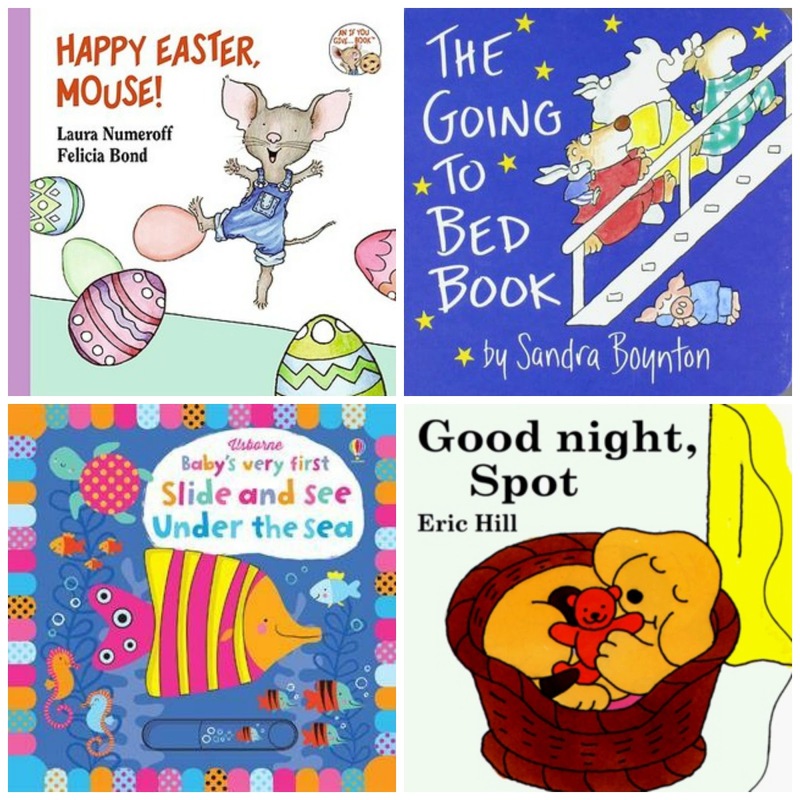 Goodnight, Spot by Eric Hill - This is one of our favorite bedtime books. It's a cute one, easy to read and very short, which is good for my 11 month old. He loves to hold this book in his hands as it's the perfect size for little ones. Me too. It's so fun to revisit them! Mo Willems' books are so great and my son loves Skippyjon, but he isn't my favorite. They are so weird! I will have to check out No More Monsters for Me...he loves all things monsters, so that sounds right up his alley. Thanks for the recommendation. Thanks for visiting, Christina!